Now that I travel more frequently for both work and dance, I have started caring more about the luggage and bags I use. This year I discovered Tom Bihn, a small US company based in Seattle. I have been regularly using one of their backpacks (the Synapse 19), and a briefcase/messenger bag (the Pilot). I love these bags and highly recommend them. I have also started testing one of their larger bags, the Aeronaut 30, but I’m not yet ready to do a full review of it. I love my Synapse 19. I use it everyday, and it can fit far more things than I expected for a bag so small. The main compartment can hold a fair bit (my 15” Macbook Pro fits in without a problem with a pair of dress/dance shoes and an iPad Pro). The front part of the bag contains four smaller compartments. The genius of the bag design is that when you stuff the main compartment, it doesn’t rob space from these front compartments. Having a dedicated water bottle compartment in the centre of the bag also helps keep the bag from feeling off balanced. I didn’t realise just how important this feature is for making a backpack feel more comfortable. Scattered throughout the bag are tiny o-rings for attaching smaller organisation pouches or keys. These o-rings have changed the way I pack and use my bag. Finally, Tom Bihn has just introduced an optional internal frame to help the bag keeps its shape better. I’m looking forward to trying this out when mine arrives. There has been much digital ink spilled writing praises about the Synapse 19 (and it’s bigger sibling the Synapse 25). I don’t have much else to add, other than this is the best bag I’ve ever owned. Khalil Gibran once said “Work is love made visible.” Every time I use this bag the love and care that went into it is palpable. I’ll never design a bag, but wearing the Synapse reminds me of the level of mastery, excellence, and craftmanship that I aspire to in my professional and personal life. While the Synapse 19 can be unassuming, it isn’t the most professional bag. For the past month I’ve been trying out the Tom Bihn Pilot–a kind of briefcase/messenger bag better suited for more professional settings. What I like about this bag is that, like the Synapse 19, it qualifies as a personal item on airlines. I tested the bag in both a ballistic material and in a lighter Halycon material. There isn’t much difference between the two of them, and I decided to keep the ballistic version as I liked the look of it a bit better. Normally, I don’t like shoulder bags, or carrying bags cross-body, but the Tom Bihn Absolute strap helps make things much more comfortable. The Pilot also comes in a smaller version, the Co-Pilot, for those looking for an even more compact bag. The Tom Bihn Pilot fits easily under the seat of a United aircraft with room for my legs. Pictured above in the seat pocket is the Tom Bihn small Snake Charmer that I use to hold all my cables, earphones, batter backup, and snacks. The Snake Charmer fits perfectly in either front pocket of the Pilot. Something I had been looking for online, but hadn’t found was how much the Pilot could hold in comparison to the roller bag I typically use as a carry on. As shown in the video, I can use the Pilot as a super packing cube, allowing me to pack roughly half of what I would normally fit into my TravelPro wheeled suitcase. The front pockets are great for fitting in smaller packing cubes (Tom Bihn sells packing cubes for the Pilot, but I’ve found the Eagle Creek packing cubes to work as well). The problem I have with the front pockets, though, is that they are so tall that it is easy to lose loose items in them. I think having one of the front pockets be split into two stacked pockets would make it easier to organise my things. Having these be each half the height of the current pocket, or a 1/3 and 2/3 height split would allow me to use them like I do the side pockets of my Synapse 19. I also wish that these pockets had two o-rings per front pocket instead of just one. Right now I have to reach further into the pocket to find my key strap than I’d like. Using the Tom Bihn Pilot as a "super packing cube" that fills up half of my TravelPro carry on suitcase. Inside the Pilot are two small Eagle Creek packing cubes and a medium packing cube along with an umbrella. The Pilot only takes up a bit more room than the packing cubes by themselves. One thing that has surprised me is that, after a month of use, I prefer the Pilot to the Synapse 19 as a dance bag. I can fit two pairs of mens size 11 dress shoes into the main compartment of the Pilot along with an iPad, something I can’t do with the Synapse. The front pockets can then still carry a water bottle, cables, and all sort of other miscellaneous things. I’m finding myself using this in briefcase mode (no shoulder strap) for carting around my dance things. Overall, this is a high quality bag with lots of clever features that has been a delight to use. After I made this video, my Tom Bihn Aeronaut 30 bag arrived. This is a larger backpack/duffle bag that can replace a wheeled suitcase. I can fit the same amount of stuff in my Aeronaut 30 as I can my TravelPro suitcase carryon, but it weighs significantly less and can more easily fit in overhead bins of aircrafts. I’ve only taken it on one trip, but have been impressed by efficient it is to pack and use. I want to take it on a few more trips before passing judgement on it, but so far I love it. The only negative is that, when fully loaded, it can get quite heavy to carry around for long periods of time as a backpack or shoulder bag. Still it is simpler to navigate and move about with compared to my TravelPro suitcase. There are so many clever, thoughtful, touches. I can’t wait to travel with this bag again. The Tom Bihn Aeronaut 30 and Pilot packed and ready to go at the Austin airport. Tom Bihn bags are expensive (though not Briggs and Riley or Luis Vutton expensive). They make premium quality products and charge accordingly. Tom Bihn also sells lots of accessories for each bag. These aren’t strictly necessary but are often nice to have, and adding these in can drive the price up. If you can swing it, these bags are worth it. Tom Bihn also has a generous return policy, and a killer warranty. Finally, Tom Bihn bags sell for shockingly high prices on eBay. It is common to see bags that are years old sell for 75% of their original value, meaning that you can recover a good deal of your initial investment should you choose to sell it after some time. Good luck getting me to sell my Synapse 19, though. I’m not sure I’ll ever give it up. I paid for all the products in this review. I make no money off any of the links included in this article. While visiting the University of Vienna for a conference, I came across Erwin Schrödinger's old desk set up in the lunch room. Sitting down at the desk to eat my lunch I stumbled upon a new quantum "paradox". Henry Reich and Jasper Palfree have created an amazing interactive version of the Periodic Table. As you change temperature, you can see the elements transition between different states of magnetism. You can also see at what temperatures an element changes state from solid to liquid to gas. There is even an option to display temperatures in Fahrenheit for the heathens among you. If that isn't awesome enough, Henry makes clever use of Youtube, HTML5, and the interactive periodic table to explain how to destroy a magnet. You can also click on any element to see a clip, courtesy of Periodic Videos, about it. This is a great educational tool. I can't wait to see what Henry and Jasper come up with next. This is a must-read article on the subject of connection in dance. One of the biggest breakthroughs in my own dancing came when I realized that the lead can initiate a movement that the follow then completes. How a follow chooses to move in response to the lead is where much of their creativity is expressed. This movement then influences how the lead subsequently moves, and the cycle continues. The best dances I have occur when ideas flow back-and-forth seamlessly. The distinction between leading and following disappears, and the dance becomes about two people together weaving something beautiful out of the music and movement they share. Yin & Yang. Lead & Follow. The idea is simple–"make videos of you doing Charleston in front of famous places around the world... and share." So far over two-dozen videos have been submitted. This one from Berlin is my favourite. Excellent dancing and production values. UPDATE This video from Nashville, released today, gives the Berlin one a run for its money. Great song choice. 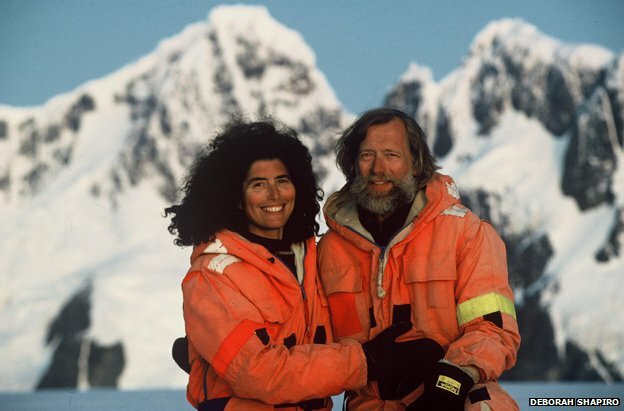 Deborah Shapiro writes about the 270 days she spend in isolation with her husband, Rolf Bjelke, in the Antarctic. It never ceases to amaze us, but the most common question Rolf and I got after our winter-over, when we spent 15 months on the Antarctic Peninsula, nine of which were in total solitude, was: Why didn't you two kill each other? We found the question odd and even comical at first, because the thought of killing each other had never crossed our minds. We'd answer glibly that because we relied on each other for survival, murder would be counter-productive. Showing tangible signs of caring and of empathy ensures that cabin fever never takes hold. It's one of the personality traits Sir Ernest Shackleton looked for, when signing-on crew for his expeditions. As Rolf, who has Shackleton as a role model, always says: "I can teach anyone how to sail, but I can never change a person's personality." It appears a huge meteor has just struck somewhere over Russia. Phil Plait is posting frequent updates over twitter. What is amazing is how many cameras seem to have caught the entry, and subsequent breakup, of the meteor. In Russia most cars have dashboard cameras installed to collect evidence in case of accidents. There are some crazy videos of Russian driving on Youtube, but this is the most awe-inspiring dashcam footage I have seen yet. UPDATE: Phil Plait has posted a more in depth analysis of the meteor strike, including some impressive footage. Chris Hadfield, the Canadian commander on the International Space Station, has been posting breathtaking pictures of the Earth from space. His Twitter feed is a must follow. Codeacademy has some great HTML5 cards along with the HTML/CSS code to implement them. To implement the custom CSS, I used the Wordpress plugin Specific CSS/JS for Posts and Pages to load the code only on the pages where the card is displayed. The history of Santa Claus, or as C. G. P. Grey refers to him, the magic fat man. Adam Ruben writes about the attitude in academia that a moment not spent in the lab is a moment wasted. My "Batman job" is swing dancing. Many of the best things in my life are a direct result of my being involved in a dance community. I met my wife through dance, I have become a better teacher, and my communications skills have dramatically improved. I remember keeping my physics life and dance life separate at the beginning of grad school after being warned by some well-intentioned individuals that such "poppycock" hobbies would hurt my academic career. Then I realized that dance is a big part of who I am, and I did not want to work at a job where I could not be myself. If my hobbies and passions keep me from getting an academic position, then it isn't a place I want to work. Now my physics and dance lives bleed into one another, and this has led to a number of interesting opportunities for me. My "Batman job" has made me a better physicist. I would wager there are far more scientists with "Batman jobs" than those without. A gripping tale of an avalanche that overwhelmed some of the best backcountry skiers in the world. There is a lot of interesting science in this article about how avalanches form that is expertly interwoven with the human drama that unfolds. This story took six months to write and it shows. One of the best usages of HTML5 I have seen. If you read one thing this week, this should be it. Excellent overview by Jennifer Ouellette of a new paradox that is taking the physics world by fire. I first heard about this a month ago from Patrick Hayden. It looks like this could turn into one of the great thought experiments that tackles the difficulties merging quantum mechanics and general relativity. Together, these concepts make up what Bousso ruefully calls “the menu from hell.” To resolve the paradox, one of the three must be sacrificed, and nobody can agree on which one should get the ax. Physicists don’t lightly abandon time-honored postulates. That’s why so many find the notion of a wall of fire downright noxious. “It is odious,” John Preskill of the California Institute of Technology declared earlier this month at an informal workshop organized by Stanford University’s Leonard Susskind. For two days, 50 or so physicists engaged in a spirited brainstorming session, tossing out all manner of crazy ideas to try to resolve the paradox, punctuated by the rapid-fire tap-tap-tap of equations being scrawled on a blackboard. But despite the collective angst, even the firewall’s fiercest detractors have yet to find a satisfactory solution to the conundrum. Joe Polchinski, one of the authors who published the paper on the blackhole firewall paradox, has a more technical write up of the subject over on Cosmic Variance. I love that one of the postulates is called "no drama." Visualization of "Pale Blue Dot"
I am a sucker for all things Carl Sagan.